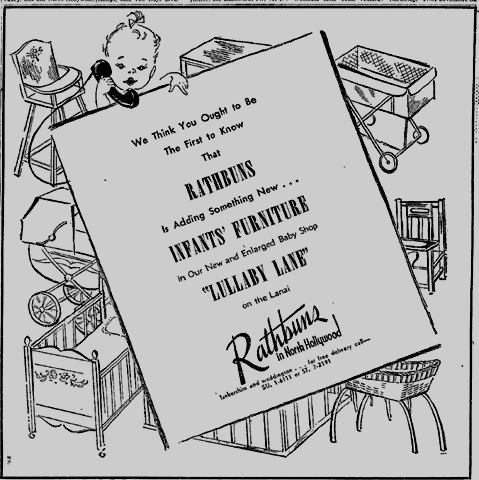 Rathbuns enlarges its Baby Shop for new generation of Baby Boomers, Van Nuys News, March 8 1951. As a city or community grows more prosperous, so does its retail establishments. Simple businesses with few choices of product give way to more upscale shops with expensive, and diverse selections. Hollywood and Los Angeles outgrew their dry goods stores and turned to lavish department stores like Hamburger’s, the Broadway, and Bullock’s for finer quality of goods. Lankershim, which later became North Hollywood, also advanced beyond dry goods stores into their own department stores Yeakel-Goss and Rathbun’s. While these businesses carried some of the same labels as did the more upscale establishments over the hill, they focused on more medium-priced goods appealing to the middle brow tastes of the average farmer/rancher or small businessman. Mary Mallory’s “Hollywoodland: Tales Lost and Found” is available for the Kindle. Rathbun’s in the 1922, San Fernando Valley city directory. Both stores arose around the same time at the heart of Lankershim’s retail shopping area near the intersection of Lankershim Boulevard and what is now Magnolia Boulevard. They represented the dreams and hard work of Fred Yeakel, John Goss, and Hall E. Rathbun, men who immigrated from the Midwest looking to achieve some measure of success in California. Hall E. Rathbun, born April 10, 1887, in Iowa and with only a seventh grade education, arrived in Los Angeles in 1905 and turned to the dry goods business when he opened a store at Pico Boulevard and Figueroa Street. Rathbun grew successful enough that by 1921 he opened his own small department store at 5337 Lankershim Blvd. in Lankershim, an area also growing in importance and prominence. The small town, aiming for success, changed its name to North Hollywood in 1927 to capitalize on the popularity of its neighbor Hollywood, just over the Cahuenga Pass. Rathbun bought an advertisement in the San Fernando Valley City Directory in 1922 promoting the sale of “dry goods, men’s furnishings, and shoes” in his shop. The Los Angeles Times notes on March 15, 1924, that the merchant incorporated to the tune of $50,000 with his whole family listed as directors of the corporation. Around this time he constructed a home at 11128 McCormick street in North Hollywood, just blocks from the store. Rathbun built his word of mouth and contacts by joining service groups and by acting as Vice President of the Western States Merchants’ Association, per the January 14, 1932, Los Angeles Times. He helped charter the North Hollywood Kiwanis Club and served as the President of the North Hollywood Chamber of Commerce from 1931-1933. Later in his career Rathbun supported the construction of the North Hollywood Park and the Cahuenga Pass Freeway. Though Hall Rathbun passed away on August 4, 1946, the family continued operating the department store through 1976, when ads disappear from the Los Angeles Times. The location of the store now appears to be an empty lot just south of the Federal Bar; perhaps the building suffered damage in the 1994 Northridge earthquake and was demolished. The two men were obviously very close; they and their wives lived at 1238 La Brea Ave. in 1923 and in 1928 they built a duplex together. Yeakel and his wife resided at 11029 Hesby St. and Goss and his wife lived at 11027 Hesby. By 1930 both men moved to Huston Street. Yeakel-Goss carried many of the same lines and brands as did larger department stores like the Broadway and Bullock’s, often included in advertisements for major brands listing where their products were sold. They sometimes ran their own ads or even purchased fashion advertorials in the Los Angeles Times which promoted the sale of a stylish dress at their shop. Yeakel & Goss goes out of business, Valley News, June 16, 1977. By 1977, after 56 years in business, the families were ready to retire from retail sales. Goss had passed away on September 21, 1975, and Yeakel lacked the heart to go on. The June 16, 1977, Van Nuys Valley News contained a large ad noting their going out of business liquidation. By 1981 the space served as a St. Vincent de Paul Thrift Shop. A suspected arson fire on January 27, 1987 caused major damage to the building, leading to its destruction. The site is now a large complex of restaurants and stores including Panera Bread, T-Mobile, Panda Express, Chipotle, and the like. During its heyday as an independent community, North Hollywood contained two prosperous department stores like Rathbun’s and Yeakel-Goss. Now that it is just part of the city of Los Angeles and not as prosperous as its early days, the neighborhood possesses no department stores or major retail at its very heart. This entry was posted in Architecture, Fashion, Hollywood, Hollywood Heights, Mary Mallory, San Fernando Valley and tagged architecture, hollywood, Hollywood Heights, Mary Mallory, Rathbuns, San Fernando Valley, Yeakel and Goss. Bookmark the permalink. The reason that John Goss and Fred Yeakel were close is that John Goss was married to Fred Yeakels sister, they were brothers-in-law. I was searching for any articles on Rathbun’s Department Store in North Hollywood when I found this article. The ad for baby furniture stood out to me. I recognized it! My mother used to do the artwork for most of their ads, back in the 50s and into the 60s. Do you know the name of the illustrator? Unfortunately, a good intended family member destroyed most of my mother’s artwork when she died in 2013. My mother’s name was Betty Samsel Collins. She grew up in North Hollywood. We used to go to that Dept. Store!